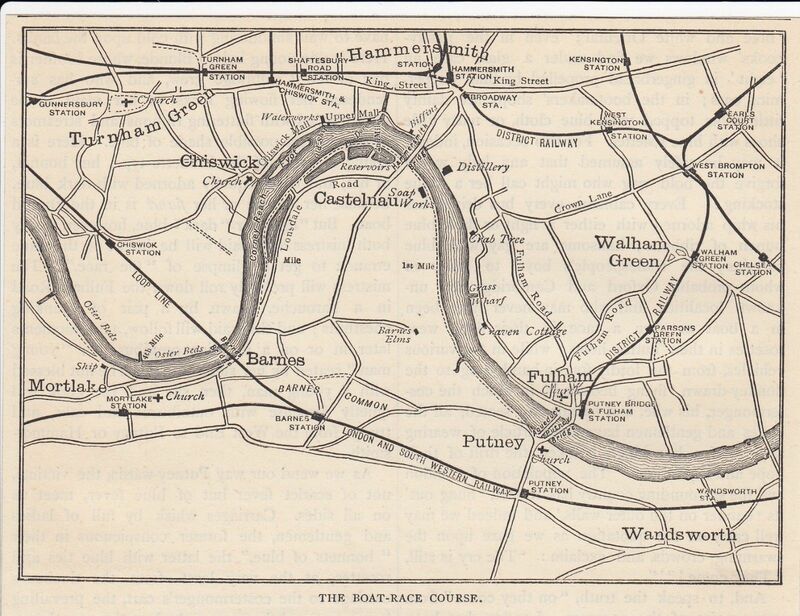 The Putney to Mortlake Course as illustrated in 1875. While Boat Race Day is still fresh in our minds, Tim Koch has a closer look at the course. When I teach beginners the basics of rowing, I start the first lesson by telling them that rowing is simple but not easy. The same applies to the Thames Championship Course, these days more commonly called The Boat Race Course (though it is also used in reverse for most of the Tideway head races). 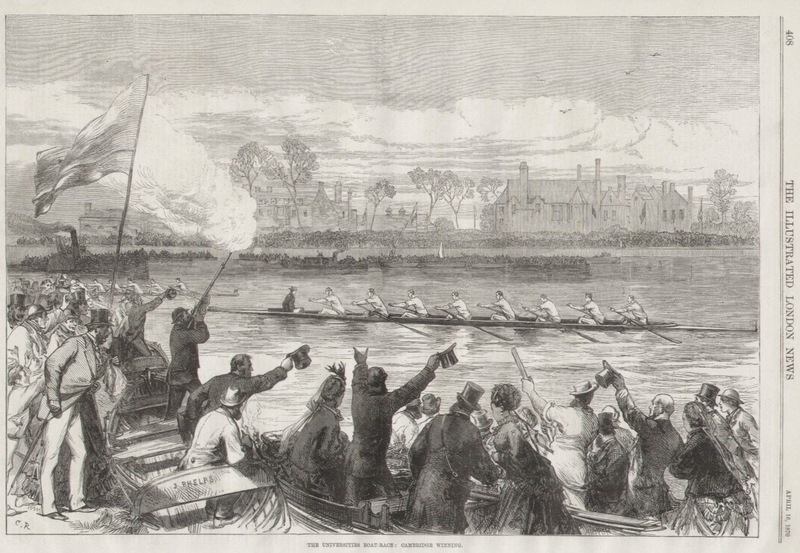 The course between Putney and Mortlake (P to M) was used by the old watermen in their wager races as the bends over the four-and-a-quarter miles even out the distance for both crews between the start and the finish. 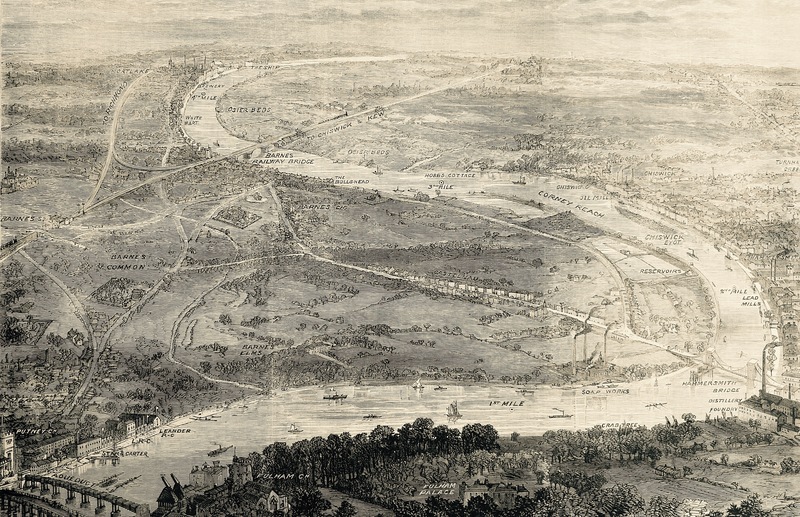 The only other way to produce a fair race would be to find a (rare) long and straight stretch of river (such as Henley Reach) or to have a staggered start or finish (unsatisfactory, and open to cheating, especially when gambling was involved). Below, I have reproduced in bold a piece from this year’s official Boat Race Programme; it is a very nice explanation of how the course runs, clearly illustrating that it is ‘simple but not easy’. Learn this and impress/bore your non-rowing friends on the next Boat Race Day. The course depicted in 1888. The course between Putney and Mortlake has been home to the Men’s Boat Race since 1845 and the Women’s Boat Race since 2015. 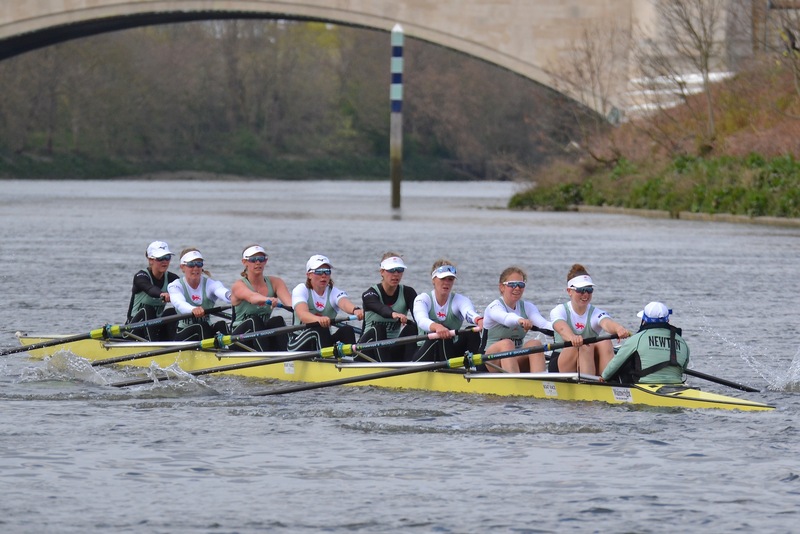 The Boat Race is held on the incoming ‘flood’ tide, the Women’s Boat Race starting two-and-a-half hours before high tide in Putney, and the Men’s Boat Race starting one-and-a-half hours before. This means the crews will race against the stream, but with the flow of the tide. A London Transport poster from 1926. 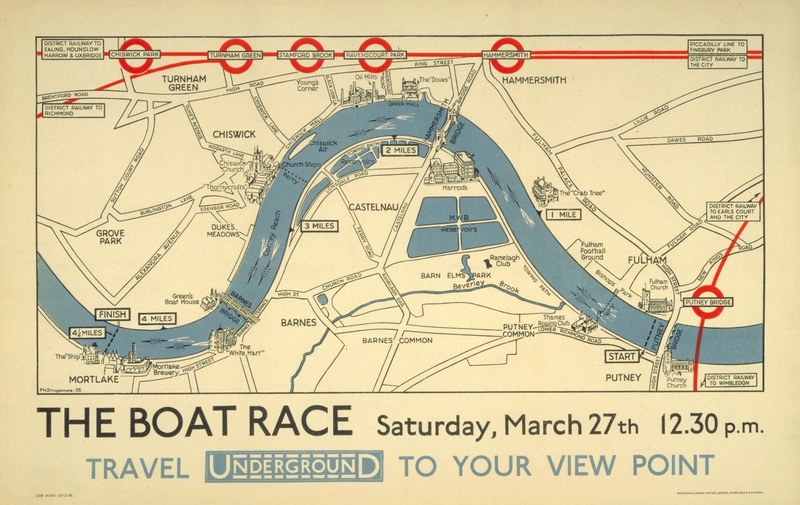 The course for the Boat Race comprises four bends; two at the start and finish in favour of the Middlesex or north bank station, and two in the middle favouring the Surrey or south bank station. 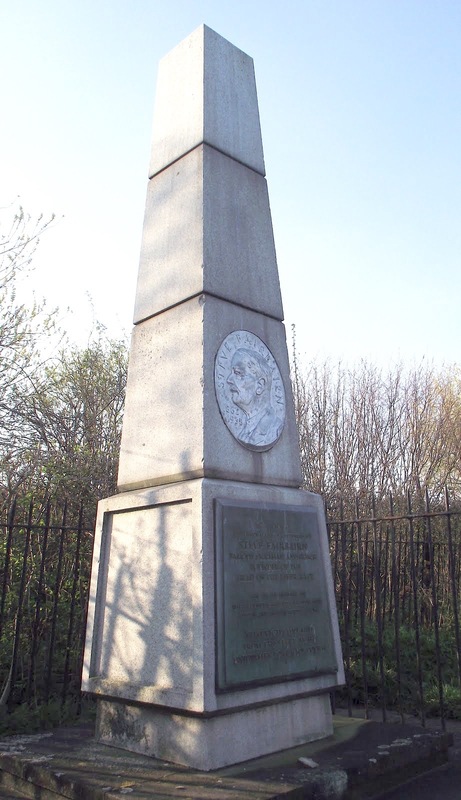 The start of the race is marked by the University Stone, set in the pavement a few hundred yards upstream from Putney Bridge. On the start, sometime in the early 1900s, looking from Surrey to Middlesex. Cambridge is on Middlesex, Oxford is on Surrey – so it could be any one of eight races between 1900 and 1914. Can any HTBS Types somehow work out the exact year? For the first quarter of a mile, the course is quite straight. Then begins the first Middlesex bend, said to be worth a third of a length advantage to the crew drawn on that station. The bend is almost three-quarters of a mile long and takes the crews up towards the Mile Post, the first of the classic race timing points. The Mile Post as it is today, the Steve Fairbairn Memorial. Before it was placed here, there was just a wooden post making the end of the first mile of the P to M course. For the next two miles, the bend in the river favours the crew drawn on Surrey and is said to be worth about one length to the inside crew. Near the apex of the Surrey Bend is Hammersmith Bridge. Shortly after the two-mile point, the Race arrives at Chiswick Reach, heralded by the narrow island, Chiswick Eyot, near the Middlesex bank. 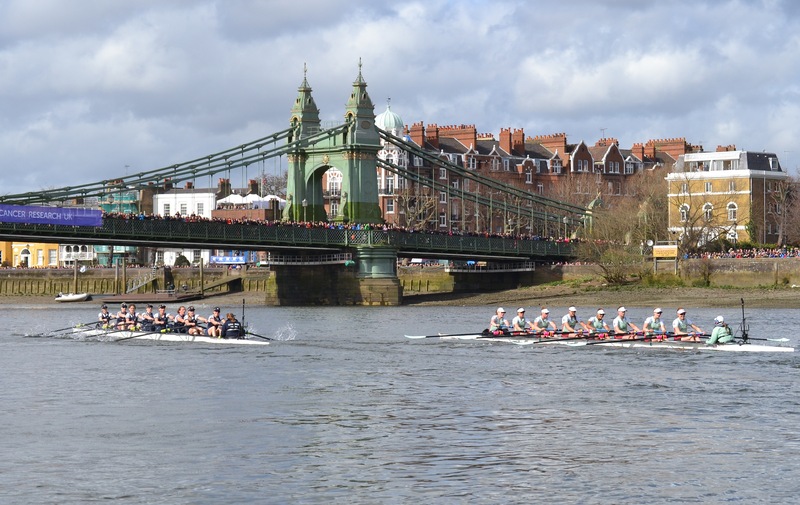 The 2016 Women’s Boat Race approaches Hammersmith Bridge. At the end of Chiswick Reach is the third timing station, Chiswick Steps. The second Surrey bend then begins to even out as the crews approach the three-mile mark. Here is the point known as the Crossing where the best rowing line runs directly across the middle of the river, and this is where the boats lose the shelter of the shore and become vulnerable to any prevailing south-westerly wind. 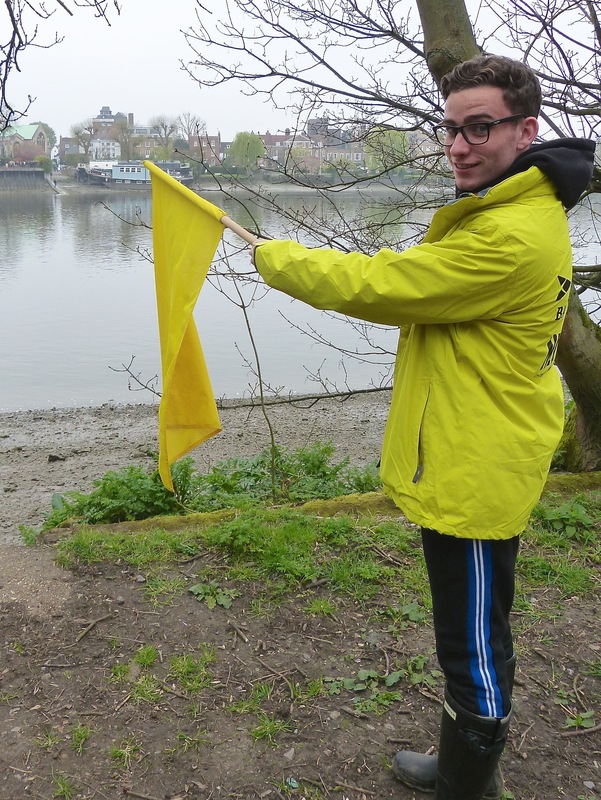 The Flagman at Chiswick Steps, 2019. He will drop the flag as each boat passes enabling the timer following the race to record the exact time each boat reached this point. Now begins the final bend in favour of the crew on Middlesex, and when the Race passes under Barnes Railway Bridge there is barely three-quarters of a mile to go. Only three times in the history of the Boat Race has the losing crew at this point gone on to win the Race – in 1885, 1952 and 2002. The finish line at Mortlake is just a few yards downstream from Chiswick Bridge, marked by a second University Stone. The finish, Middlesex side. The 2019 Cambridge Women’s crew approach University Post during a practice row. 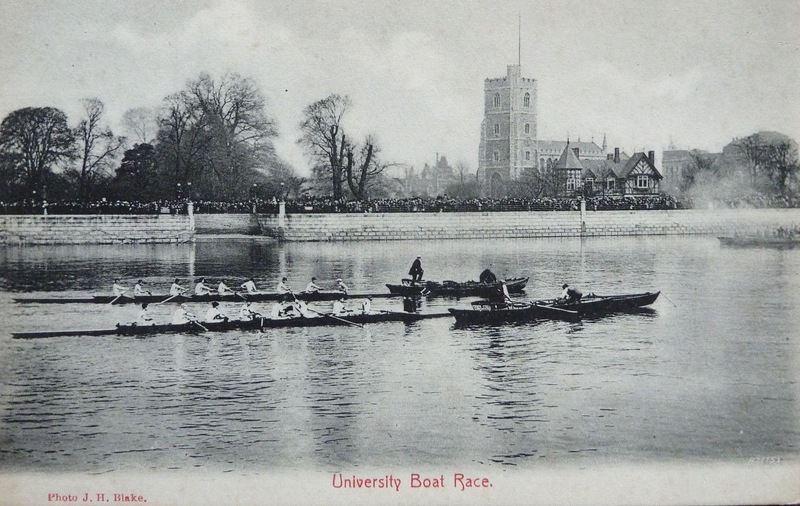 In the past, the last university to win the Boat Race had its colour at the top of the post. The finish, Surrey side. 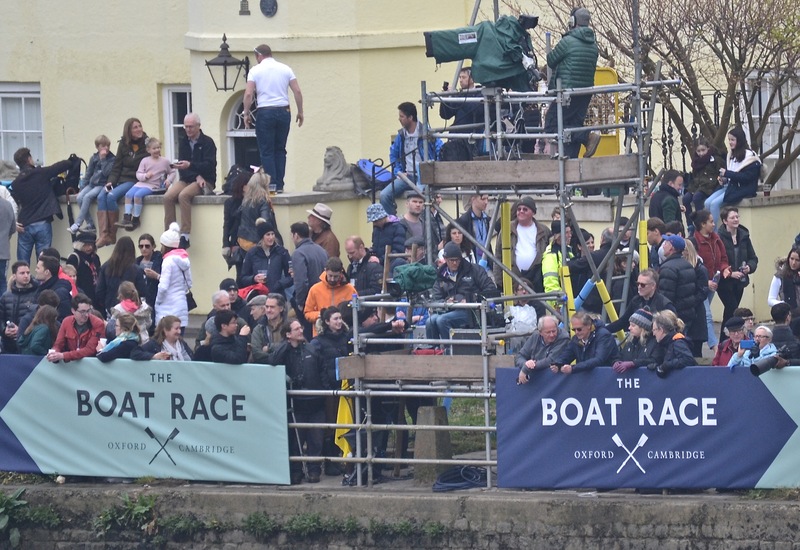 Pictured on Boat Race Day 2019, the Mortlake University Stone is visible behind the scaffolding, in the gap between the two banners. Sitting above University Stone is Ben Kent, the finish judge. Although he has access to video playback, Ben judges the finish and the distance using his line of sight to the University Post opposite. This primitive system did not fail in his ‘one foot’/0.05-second verdict of 2003. Remarkably, only four men have performed the role of finish judge since it was decided that ‘gentlemen’ and not ‘professionals’ should perform the task following the 1877 ‘Dead Heat’ controversy. Ben, who rowed with reserve crew, Isis, while at Oxford, is the third generation of his family to judge the finish of the University Boat Race. The finish of the 1870 Boat Race. Chiswick Bridge was not built until 1933. 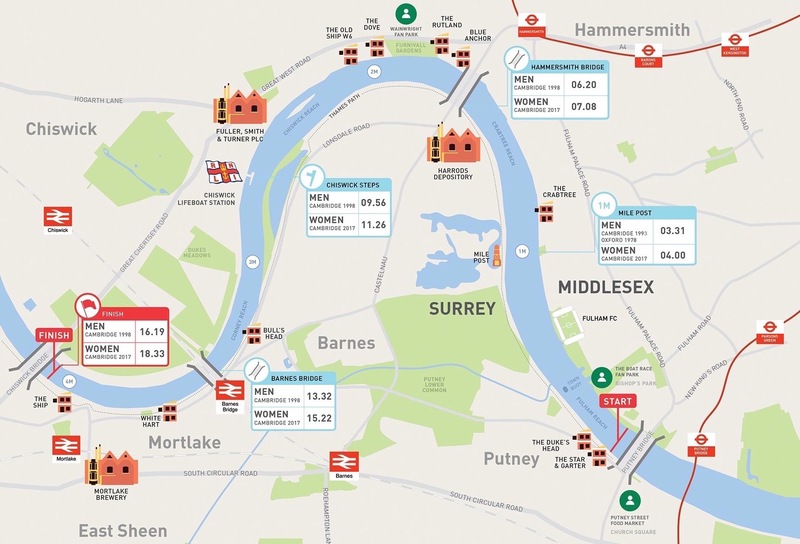 A map of the course produced by the Boat Race Company for the 2019 Race.